Forget about dashing through the snow this holiday season. At Bay View on the Boardwalk in downtown Myrtle Beach, South Carolina, guests can take a leisurely stroll along the sand-swept Myrtle Beach Boardwalk to a winter wonderland of Christmas lights, decorations and festivities in the heart of America's favorite beach vacation destination. The annual Holidays on the Boardwalk celebration runs from Black Friday (Nov. 24) through New Year's Day (Jan. 1), and all along the 1.3-mile oceanfront walkway. 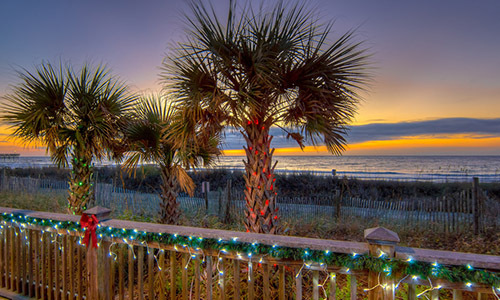 Featuring colorful Christmas lights, including the seasonal display on the Myrtle Beach SkyWheel, and beach-themed decorations, the downtown district magically transforms into a scenic seascape setting for a unique vacation experience. But the Festival of Lights is just one of the many free attractions on the Myrtle Beach Boardwalk during the holiday season. The main stage at Plyler Park will be the site of Christmas concerts and a DJ, as well as live music by local bands to put some pep in your step during your shopping spree. Visitors will also encounter a bizarre mix of costumed characters roaming the Boardwalk, including Christmas-themed favorites like Santa and his elves and The Grinch, as well as popular super heroes and princesses perfect for posing with for selfies. The tree lighting ceremony on Saturday, Nov. 25, kicks off the six-week-long celebration. * A Very Broadway Christmas: Broadway at the Beach is Myrtle Beach's hottest spot for year-round entertainment, especially over the holidays. The Christmas festivities begin with the Dec. 2 Tree Lighting Ceremony, which starts with a Christmas parade around the complex and ends with a dazzling display if lights and fireworks. Broadway at the Beach keeps the spirit going all month with live concerts, entertainment and beautifully decorated shopping villages. * The Great Christmas Light Show: The 15-mile trip to North Myrtle Beach is well worth the drive to see this amazing display. Visitors can ride around the North Myrtle Beach Park & Sports Complex and view the exhibits from the car, or get out and walk along the trails to get an up-close look at the lights and displays. Open from Nov. 24 – Dec. 31, The Great Christmas Light Show features more than 2 million lights, 50 different exhibits and lots of holiday activities, such as arts and crafts, making hot cocoa and Shmores, listening to live music at the outdoor pavilion, and posing for pics with Santa. * The Market Common: Few places spruce up for the holidays like The Market Common, and this upscale, urban-style shopping district offers a lot more than just great retail opportunities. The six-block shopping center and dining hub also lights up the atmosphere with lavish Christmas displays, and the Grand Cinema is the sight of the official tree, which holds its lighting ceremony on Dec. 5. Horse carriage rides and other special events make The Market Common a must-visit for the holidays. Why stay home for the holidays again when Bay View on the Boardwalk in Myrtle Beach has everything you need for a happy Thanksgiving, merry Christmas and a happy New Year.